When most people are stung by an insect, the site develops redness, swelling, and itching. However, some people are actually allergic to insect stings. This means that their immune systems overreact to the venom. Symptoms of a SEVERE REACTION may include two or more of the following: itching and hives, swelling in the throat or tongue, difficulty breathing, dizziness, stomach cramps, nausea, or diarrhea. In severe cases, a rapid fall in blood pressure may result in shock and loss of consciousness. This reaction is called anaphylaxis. Anaphylaxis is a medical emergency and may be fatal. If you have these symptoms after an insect sting, get emergency treatment. Yellow jackets’ nests are made of a paper-mache` material and are usually located underground, but can sometimes be found in the walls of frame buildings, cracks in masonry, or woodpiles. Honybees and Bumble Bees are non-aggressive and will only sting when provoked. Honeybees live in colonies or “honeycombs” in hollow trees or cavities of buildings. Paper Wasps’ nests are usually made of paper-like material that forms a circular comb of cells which opens downward. The nests are often located under eaves, behind shutters, or in shrubs and woodpiles. 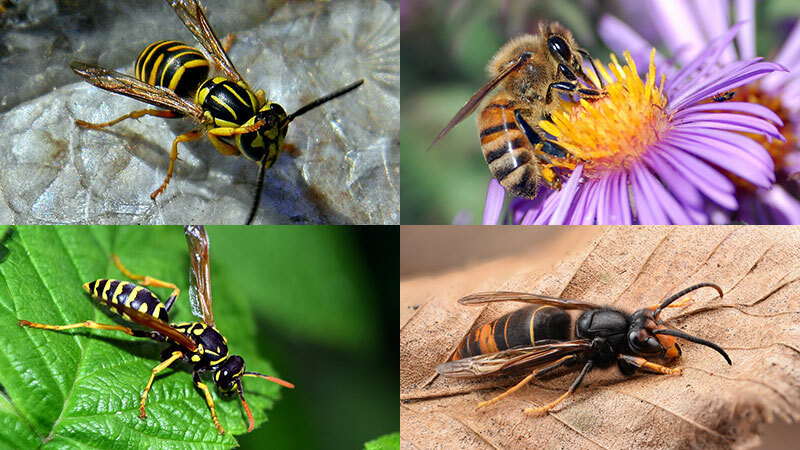 Hornets are usually larger than yellow jackets. Their nests are grey or brown, football-shaped, and made of paper material similar to that of yellow jackets’ nests. Hornets’ nests are usually found high above ground on branches of trees, in shrubbery, on gables, or in tree hollows. Stay away! These insects are most likely to sting if their homes are disturbed, so it is very important to have nests around your home destroyed. If flying stinging insects are close by, remain calm and move slowly away. Avoid wearing brightly-colored clothing and perfume when outdoors. Because the smell of food attracts insects, be careful outdoors when cooking, eating, or drinking sweet drinks like soda or juice. Beware of insects inside straws or canned drinks. Keep food covered until eaten. Wear closed-toe shoes outdoors and avoid going barefoot. Also, avoid loose-fitting garments that can trap insects between material and skin. If the insect left a stinger in your skin, remove as soon as possible to avoid receiving more venom. A quick scrape of your fingernail removes the stinger and sac. Avoid squeezing the sac. For all stinging insects, try to remain calm and brush these insects from the skin. Then immediately leave the area. If you are severely insect allergic, remember to carry an auto-injectable epinephrine with you at all times! Learn how and when to self-administer the epinephrine, and replace the device before the labeled expiration date. Remember that epinephrine is a rescue medication only. Once administered, you should immediately proceed to the Emergency Room or call 911 for further treatment and observation. If you have had a serious reaction to an insect sting, make an appointment with an allergist. An allergist can properly diagnose and provide a treatment plan to help you feel more confident and enjoy being outdoors.